Every thing in this world have its own importance, This application brings the information about the Insects that how they are proved to be Useful & what sort of importance they have. Adult insects or flies play role in ensuring the pollination of crops and low plants. Around the world farmers especially are interested to increase their yield of orchard. 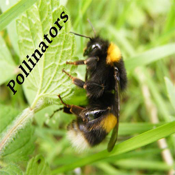 This application "Pollinators" have full description of all that insects and flies that maximize the yield and ultimately fruit setting.